The Requirements were REVISED effective in 2015. First-Level Supernova Award for Venturers. 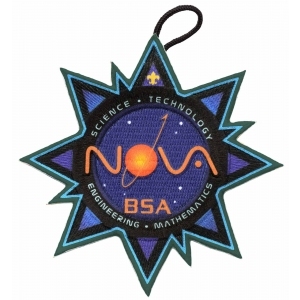 You must be a Venturer (or Sea Scout) to earn a Venturer Supernova award. With your parent's and unit leader's help, you must select a council-approved mentor who is a registered Scouter. You may NOT choose your parent or your unit leader (unless the mentor is working with more than one youth). The Venturer Supernova awards recognize superior achievement by a Venturer in the fields of science, technology, engineering, and mathematics (STEM). All experiments or projects should be conducted using the highest level of safety protocol and always under the supervision of a qualified, responsible adult. Complete the Venturing Scholarship exploration. Show that you have had an average grade of B or higher (80 percent or higher) for one term or semester. Show that for one term or semester you have improved your school grades over the previous period. Discuss with your mentor the following situation: Suppose you are writing a research paper and you find a resource in which the author's words are so perfectly aligned with your perspectives and understanding that you cannot imagine a better way to put it in your paper than to use the author's own words. How can you handle such a situation while still maintaining scholarly integrity? Discuss with your mentor the following situation: Suppose you are writing a research paper and you find resources with conflicting "facts" and/or conflicting conclusions. What are some viable strategies for resolving these conflicts and deciding which resources are trustworthy? Discuss with your mentor the following situation: Suppose you are writing a research paper and have acquired dozens of resources. How would you keep track of the resources, summarize the salient parts of each resource, and synthesize the collection of resources into a coherent research paper? Get a note from an instructor* of yours that states that during the past term you have demonstrated satisfactory abilities or progress in independently completing scholarly endeavors and proactively seeking help when needed. *If you are home-schooled, you may obtain a note from a counterpart such as your parent. If you are near the end of your current term, you may ask a current instructor. Otherwise, you should ask an instructor from the immediate past term. Show that you have taken part in a scholarly activity (in school or in Scouting) that required teamwork, and discuss with your mentor what you learned about how a team of people can work together effectively, fairly, and efficiently. Find three resources (online, in a library, personal interview, etc.) of expert advice on successful teamwork strategies and discuss with your mentor what you learned about how a team of people can work together effectively, fairly, and efficiently. Write an argument of approximately 500 words that defends or opposes the principle that, "Students should be obligated to report instances of cheating by others." Discuss this with your mentor. With your crews, another crew, school class, or another peer group, conduct an ethical controversy discussion that addresses the question, "Should students be obligated to report instances of cheating by others?" Using the guidelines found in the "Venturing STEM Explorations" chapter, complete STEM explorations for four of the topics listed above. Participate in a local, state, or national science fair or mathematics competition OR in any equally challenging STEM-oriented competition or workshop approved by your mentor. An example of this would be an X-Prize type competition. Spend at least one day "shadowing" a local scientist or engineer. After your visit, discuss with your mentor your experience and what you learned about STEM careers. Learn about a career that is heavily involved with STEM. Make a presentation to your mentor about what you learned. Working with your mentor; organize and present a Nova award or other STEM-related program at a Cub Scout den or pack meeting. Be sure to receive permission from the appropriate unit leader, and plan accordingly. If a Cub Scout den or pack is not available, your presentation may be given to another youth group. Review the scientific method (you may know this as the scientific process) and note how scientists establish hypotheses, theories, and laws. Compare how the establishment of "facts" or "rules" using the scientific method differs from the establishment of "facts" or "rules" in other environments, such as legal, cultural, religious, military, mathematical, or social environments. Choose a current subject with at least two competing theories on the subject and learn as much as possible about each theory. Submit an application to the district or council Nova or advancement committee for approval.